As Wilson High head cross-country coach Thor Esbensen puts it, Wilson High senior runner Alex Slenning's meteoric rise is an anomaly. Slenning ascended from running dispassionately as an eighth-grader to fighting for a state-meet spot as a freshman and breaking a state record as a sophomore, from chasing a defending state champion partially shoeless as a junior to effortlessly upending state meet leaders as a senior, and from weathering a flurry of family tragedies to capturing the program's first-ever state title. In the culminating event of his high school career, Slenning won the 6A boys cross-country state title with a time of 15:41 at the Oregon State Championships on Saturday, Nov. 4, at Lane Community College. "I didn't know what to think. I was super happy. It was definitely one of the happiest moments of my life," Slenning said as he remembered crossing the finish line in front. "I was thinking about all of the people who have helped me and cheered me on to get to that position. I was just thankful for it all." As an eighth-grader, Slenning competed for the Wilson Cluster Middle School cross-country team, but didn't take it seriously and didn't particularly like the sport. During his freshman year, though, Slenning was inspired by his older brother Nick's steadfast commitment and encouragement. So he decided to get serious. And Wilson High coaches quickly identified Slenning's unique talents. "We identified early on just watching Alex run that there was something special about his gait. It kind of floats along the ground. A lot of people refer to him as a deer in the way he can cover ground smoothly and elegantly. And his speed transitions are very elegant as well," Esbensen said. "We saw something special in the way he ran early on. And clearly he ran some incredible times early in his career to indicate that he was on a good track." Slenning broke the freshman school record in 2014 and finished 54th at the state meet. Then he broke the sophomore state record in the 3,000-meter race, won his first of three Portland Interscholastic League titles and placed eighth in state during his sophomore season. He also shaved nearly a minute off his state time from his freshman season. As a junior, Slenning continued to improve rapidly and won four of eight races heading into the state meet. But as he navigated a sharp turn on a soggy day in Eugene, a competitor accidentally clipped the back of his shoe and dislodged it from his feet. Remarkably, he still finished third in state and posted one of the fastest times of his season — despite running partially barefoot for a mile. Slenning talks nonchalantly about the race now. "I was still really happy getting third, especially with just one shoe on," he said. "I also feel like after I finished the race, I wasn't tired and that I maybe could have got second." Esbensen says that race was just another example of the runner's talent — and his abnormal pain tolerance. "It doesn't feel good. There's a reason you don't run barefoot," Esbensen said. "But we didn't even know he lost his shoe because he just runs right through it without complaints." Heading into his senior year and with state champion Ahmed Muhumed off to college, Slenning was determined to win the state title in his final opportunity. But throughout summer and fall training, bad news kept flying his way. First, his aunt died. Then, his dad was diagnosed with cancer. Running helped Slenning cope with the emotional pain. "The way I took it, running is a stress reliever and I used my emotions to focus on running. I didn't have to deal with both at once. It was more like running was helping the other side," he said. And it worked. Slenning won six of eight races heading into the state meet, including a 12-second victory in the district race. 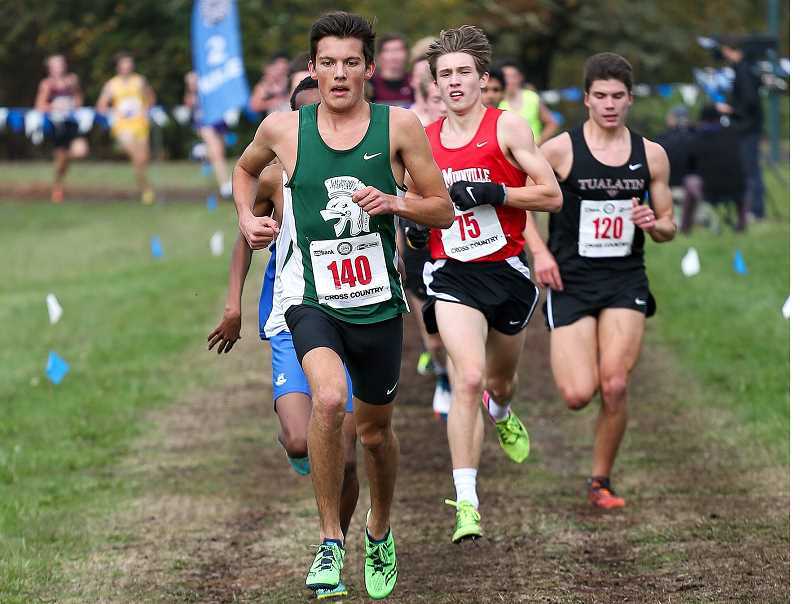 Throughout the season, Slenning had tried a variety of race styles —starting slow and finishing fast, or running with maximum effort from start to finish — so that he would feel comfortable no matter how the state meet unfolded. So when the leaders in this year's race set an unusually slow pace, Slenning hung back for a while before bolting ahead. Heading into the last mile, he increased his pace and turned a small lead into a large one. He wound up winning the race by seven seconds. "We just came through the mile and nobody was really going for it, nobody really wanted to take it. I decided I might as well take it now," Slenning said. Esbensen has headed the Wilson cross-country team since 2010 and has been involved with the program since 2004. Slenning is the first state champion he's ever coached. "It was thrilling. It's been something he's been working toward for a long time. From a coaching perspective, to see a kid who worked as hard as Alex has worked and accomplish that goal is the reason we coach," he said. Slenning received more good news recently. His father's cancer has receded and he will be OK. Slenning says he was relieved to hear the news. Slenning took a few weeks off and then began preparation for track and field season, where he will likely be a state title favorite in the 3,000. Then, he will move on to the college level. He hasn't decided yet where he plans to attend. Regardless, he will be missed. "Alex has been a key part of our program. He has been an incredible force in our program, both as a runner and as a personality. He will be sorely missed," Esbensen said. "But we are ready to move forward. We have some really gifted young runners in our program that are prepared to step up. We are also really excited to see Alex make the transition to the next level as he competes in college."